VISI Flow is a unique prediction tool, ideal for pre and post production analysis and concurrent engineering of injection moulded plastic components. Part designers, mould makers and moulders will all benefit from using Vero's innovative technology for injection simulation to achieve cost effective and reliable mould designs and the optimum moulding conditions. When a component is already in production and not performing as expected, moulding simulations can help the operator better understand the conditions inside the mould cavity during the moulding cycle. This procedure can help judge the effectiveness of different corrective actions and produce the most effective improvements to the moulding results. Pre-production and post-production analyses can certainly be very helpful but, if not related to the entire process, they do not guarantee the complete optimization of the part/mould/moulding process. This is only made possible only through an integrated CAD/CAM/CAE analysis. 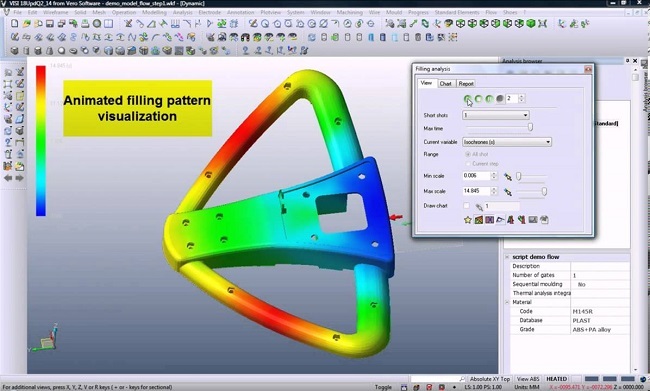 An uninterrupted data exchange between the design and the analysis environment provides the ability to identify possible critical situations, set the most effective moulding parameters, optimize the runners and cooling layout and predict problems concerning any part of the plastic component creation process. VISI Flow provides a user friendly interface with short model preparation and calculation times. Initially introduced to the injection simulation market over 25 years ago, VISI Flow combines the powerful versatility of VISI Modelling with the undisputed result accuracy of Finite Element Analysis. VISI Flow provides the complete solution for part/mould designers and plastic injection moulding technicians; from filling analysis, to warpage calculations and thermal optimization analysis. VISI Flow can work directly with Parasolid, IGES, CATIA v4 & v5, Pro-E, UG, STEP, Solid Works, Solid Edge, ACIS, DXF, DWG, STL and VDA files. The extensive range of translators ensures that users can work with data from almost any supplier. Very large files can be handled with ease and companies working with complex designs will benefit from the ease with which their customer's CAD data can be manipulated. A range of methods are available for importing or creating one of the most important mould tool features. Any feeding and conditioning system, with no limit of complexity, can be included within the analysis, and easily edited to allow for a comparative analysis to be calculated. Using a proprietary hybrid meshing technology, VISI Flow performs a real 3-dimensional flow simulation with very short calculation times. The solid mesh creation is an automated function applied to any CAD geometry providing VISI Flow with short model preparation times and rapid analysis calculations. The patented meshing approach gives consistent results unaffected by component size, complexity or wall thickness. The accuracy of the analysis result is directly related to the material characterization. VISI Flow includes an extensive material database covering a wide selection of material grades and suppliers. New materials are constantly being developed and introduced into the market place, so to guarantee an accurate representation of moulding materials, VISI Flow provides the operator with the ability to easily add new polymer grades or modify the existing data to match the exact moulding material being used. The filling phase provides the same level of control over the injection of molten polymer into the mould cavity as you have on any injection moulding machine. The filling simulation provides the ability to forecast and visualize how a component will be filled by the plastic melt front; making it possible to identify any potential aesthetic issues. The filling module provides many tools to allow the operator to investigate the moulding variables; such as pressure, temperature, shear stress, frozen skin, fibre orientation, clamping force and many others. The result presented by VISI Flow Shape allows the operator to visualize and measure the final moulded shape predicted after processing the values for the filling, holding and freezing moulding phases. Many tools are provided to the operator for evaluating the result; including viewing displacement along an axis, querying point locations to calculate the warpage, linear shrinkage and ensuring feature ovalisation stays within any set tolerance. The results will also help identify any possible defects, such as sinking or voids caused by packing conditions during the holding time. If necessary, it is possible to export the warped model geometry for comparison with the original CAD data for potential reverse engineering or improvements to the mould tool design. The thermal module is a powerful tool for the detailed analysis of the effect of the thermal conditioning system of an injection mould tool. The thermal module provides the ability to run an analysis by considering all possible thermal effects due to the heat exchange among plastic and blocks, hot and cold runners and mould inserts with highly conductive materials. The ability to analyze the cooling system allows the operator to visualize the warpage related to the cooling system and makes it possible to define the best layout to achieve the shortest possible cycle times. Other useful features include controlling both core and cavity temperatures, analyzing the temperature distribution through the insert blocks and defining the ejection time in relation to the solid fraction of the part. Other optional modules make it possible to simulate the latest moulding techniques such as sequential moulding, gas-assisted, co-injection, overmoulding technologies and crosslinking grades. As with all modules within VISI Flow, the system automatically enters key values for creating an analysis relevant to the geometry and material grade selected.